Without a doubt, the most maltreated recipe to come out of New Orleans cookery is shrimp Creole. The reason for this is that most people simply don’t have an understanding of how the roux functions as a basis for such a complex dish. Much more often than not the roux is simply disregarded as a component altogether, and what you’ll find served as shrimp Creole is little more than a handful of mealy shrimp drenched in a cayenne-infused Italian-style tomato sauce loaded with bell peppers and ladled over a pile of gummy Minute rice. 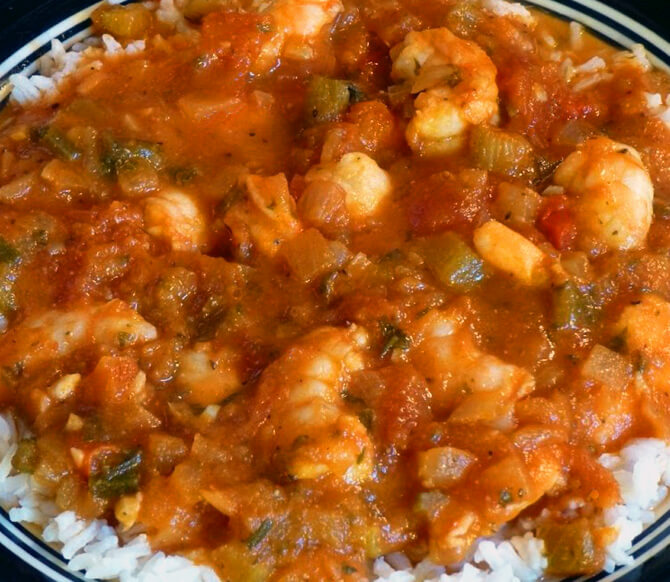 Yes, tomatoes are an essential component to a shrimp Creole, but not a tomato sauce as such. The tomatoes give flavor to a much more complex stew that includes (of course) onions, bell pepper, celery, garlic and liquids. And sure, à la Creole to most people means piquant, but this does not mean hot; spicy, yes, but not hot. Shrimp Creole is not a difficult dish to make; as with any recipe, you simply have to follow the proper procedure and proceed apace. First make a roux with a quarter cup each of flour and oil—not butter, not olive oil, just a light vegetable oil will do fine—cooking it to a rusty brown; some people will tell you to use a very dark roux for a Creole, but I prefer one a bit lighter (sue me). To this, while still hot, add two cups finely chopped white onion, one cup finely chopped celery and a half cup finely diced bell pepper. Do not over-do the bell pepper! I firmly concur with Justin Wilson who said time and time again that bell pepper is “a taste killah”, and we both agree that you can never use too much onion. Many of you will recognize this combination as a platform for any number of Creole/Cajun dishes. For a basic shrimp Creole to feed six people, sauté two pounds peeled shrimp–I recommend a 26-30 count–in a light oil with plenty of garlic, about four cloves crushed and minced, and a little pepper (do not salt). Add the shrimp (with the liquid) to the roux/vegetable mix, then immediately add two 14 ounce cans of diced tomatoes with juice. (In a perfect world, you’d use four cups of home-canned tomatoes, but I do not live in a perfect world, and chances are you don’t, either.) Add a little water to this if needed to give it the consistency of a thick soup, season with a two tablespoons dried basil, two teaspoons thyme and a teaspoon each of oregano and ground cumin. Understand please that these are relative ratios that you can adjust with neither guilt nor effort. As to pepper, some cayenne, yes, and yes to some black pepper, too, but when it comes to pepper, the best rule of thumb is to add just enough to make a statement and provide a good Louisiana hot sauce on the table. Let this stew for at least an hour (I put it in the oven uncovered and stir it two or three times), then adjust your seasonings, particularly the salt and pepper. Serve over cooked long-grain rice; let me recommend Zatarain’s, and no, I’m not getting paid for that.